How time flies and we are into the last quarter of the year already. Mid-Autumn Festival was just over a week back and I’m glad to have finally found time to make some mooncakes this year after a long hiatus for a couple of years. Thankfully this year’s mooncakes turned out alright. As I’d mentioned before in my old blog post 4 years back, I’d always looked forward to the Mid-Autumn Festival because it was always a time for family to come together and enjoy a meal. Pomelo are my favorites from this festival’s delectables, more so than mooncakes! I bought 3 large pomelos before the festival for a song and they are still sitting quietly, waiting to be pried open. And for me, there is no better way to enjoy pomelo than in the classic dessert, 楊枝甘露 Mango Pomelo Sago. The recipe as I’d written before, is actually a “Made in Singapore” dessert which became very famously associated as a Cantonese 糖水 “sweet broth” in Hong Kong. It is incredibly easy to make, requiring few ingredients. 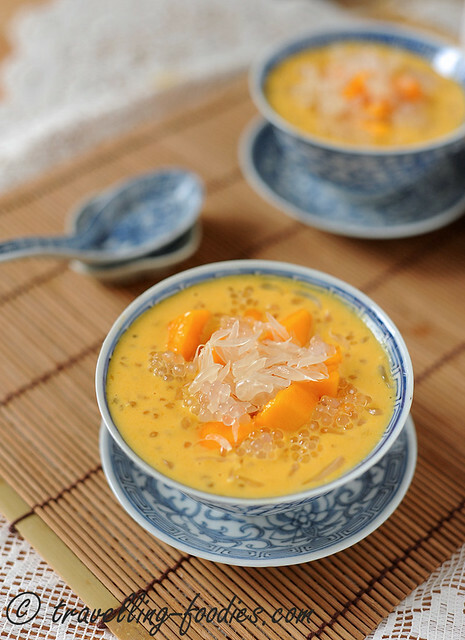 Some told me it is a spinoff from another popular classic dessert, 蜜瓜西米露 Honeydew Melon Sago but I must confess that I like this mango with pomelo pairing more! The ingredients are pretty simple to get, and thankfully mangoes are in season now. Odd it may seems at this time of the year, no thanks to the effects of El Nino which is hitting hard on us now. I bought some really nice mangga harumanis this season, an Indonesian variety which I’d tasted many years back and fell in love with. The skin remains green even when ripen while the flesh is a gorgeous egg yolk yellow. It is more of a sweet than fragrant variety which makes it highly suitable for Yeung Zhee Gam Luk 楊枝甘露 against the sourish morsels of pomelo. I usually make a simple syrup with sugar and water in a ratio of 1:1.3 but the sweetness can be adjusted depending on how sweet the mangoes used are as well as one’s personal preference of course. Evaporated milk aka 花奶 is used but one can always substitute it for coconut milk for that extra boost of lemak richness. 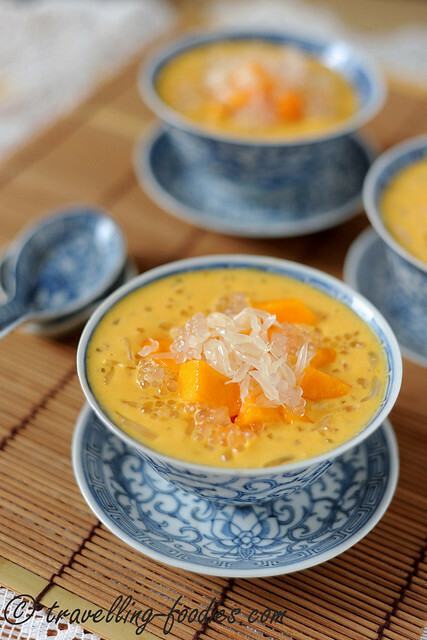 sago pearls cook really quickly and add a chewy texture to the dessert on the whole. After that, it is just a question of getting everything mixed together and chilled. It won’t be long before one can enjoy a cooling bowl of this dessert, saving grace against the hazy weather we are getting now which is driving everyone crazy. 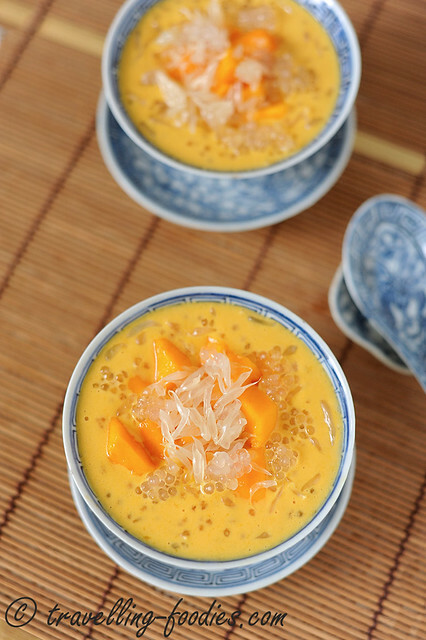 Please refer here for my 楊枝甘露 Mango Pomelo Sago recipe. It is really easy so do give it a try. 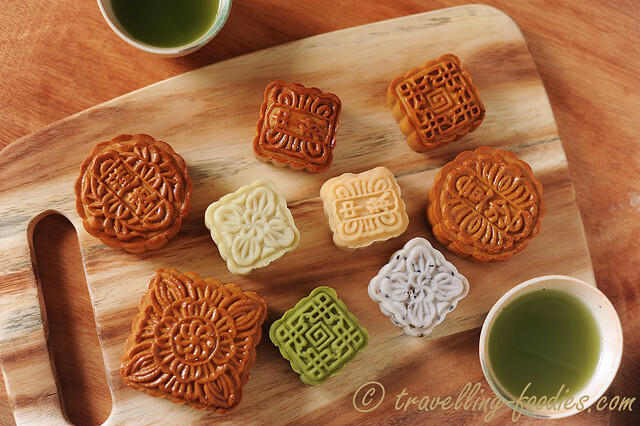 And here’s a peekaboo of the mooncakes I’d made this year, a mixture of both traditional Cantonese styled baked mooncakes as well as the popular chilled snowskin varieties. I won’t be blogging about them this year. Next year perhaps. So for those who are keen to learn, do keep a lookout! This entry was posted on October 6, 2015 by Alan (travellingfoodies). 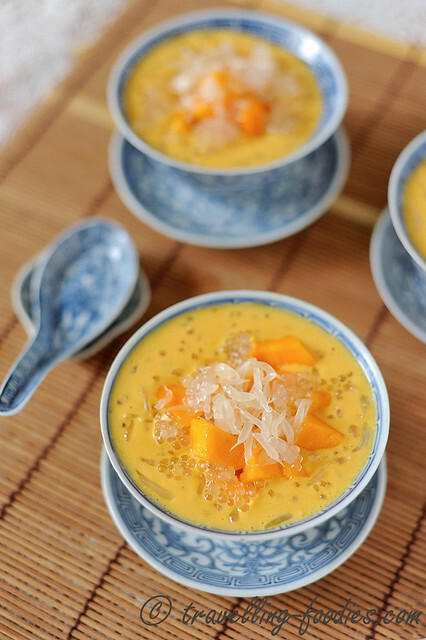 It was filed under Food, Simple Eats and was tagged with bijik sagu, cantonese, chinese dessert soup, cold, 糖水, dessert, evaporated milk, 花奶, harumanis, mango, mango pomelo sago, pomelo, sago, sago pearls, sweet, 杨枝甘露, 柚子, 中秋节, 港式. You write really well and the photos are beautifully composed n taken. Thanks for sharing! Thanks for your kind words Pauline. 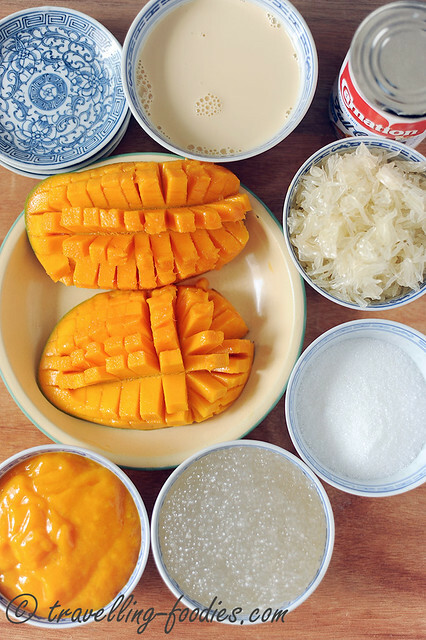 This is one of my favorite chinese desserts so we make it whenever we can find mangoes and pomelo both in season.